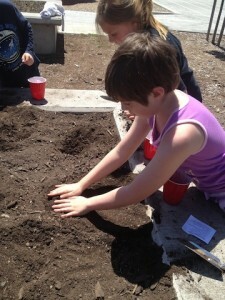 Students from Richard Pearsall’s 3rd grade class plant potatoes at Wilkes. 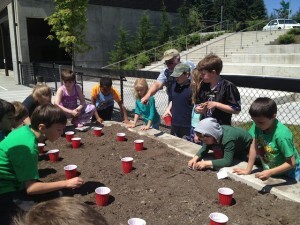 This year, EduCulture has been working with our partner elementary schools in the Bainbridge Island School District to help develop and extend our landscapes of learning from our partner farms to our instructional farm plots and back to school gardens. This work is currently in its most advanced form at Wilkes Elementary, where our staff supported teachers and students with planning and seeding the new garden beds. The redesign of Wilkes Elementary and its surrounding land afforded an opportunity for the school district to incorporate raised beds and other areas around the school grounds where teachers and students can plant, study, nurture, and harvest vegetables. We have been working behind the scenes with Blakely and Ordway Schools on plans for launching their school garden programs in 2014-15. EduCulture is also working with district leadership to build the larger support network to design these edible education programs and maintain the campus infrastructure needed to sustain them. This educational architecture goes hand in hand with our efforts this school year to develop curricular plant pathways across grade levels at our partner schools. After years of experimenting with growing a variety of vegetables and fruits with students, we have arrived at a series of plant pathways that can be both integrated into the core curricula and integrated within our local food community. These pathways connect students to food raised on our partner farms working with local master farmers, to food that is student raised on our instructional farms, to food and plants they raise in their classrooms and school gardens. These pathways allow students to study these foods along the school and community food chains, from production to processing, distribution, consumption and recycling. Our current plant pathways follow greens, pumpkins/squash, potatoes, and strawberries. 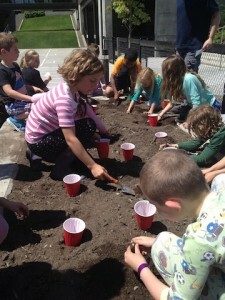 For example, at Wilkes Elementary, first graders study greens which connects to their plant life cycle units throughout the year, including this spring when they seeded kale on our instructional plot at Butler Green Farms and in their school garden. Second graders follow the pumpkin from the famous Suyematsu Pumpkin Patch with Farmer Karen Selvar to raising their own on our instructional plot at Butler Green Farms. The Third Grade studies the Makah Ozette potatoes, one of our historic Northwest food traditions. Learning from Farmer Betsey Wittick and getting heirloom seeds from Laughing Crow Farm, students raise potatoes on our instructional plot at Butler Green Farms and in their school garden. Given their deep study of Bainbridge Island history, the Wilkes Fourth Grade study and tend to patches of Island heritage strawberries on historic Suyematsu Farm, from the famous Marshall to Rainers, Shuksans, and Albions. 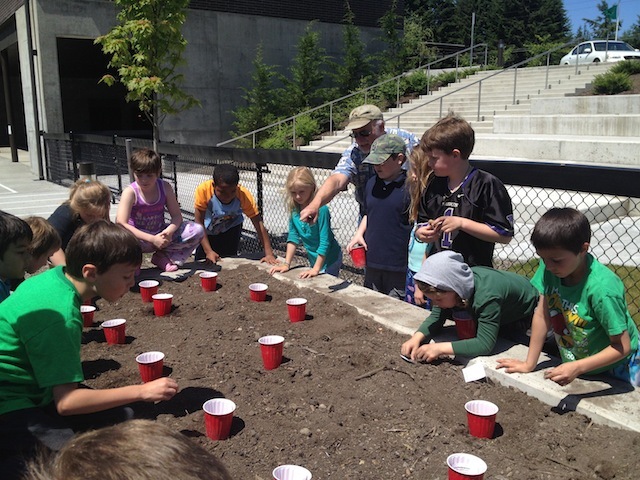 Third graders from Richard Pearsall’s class carefully plan out how they will organize and plant their bed of Makah Ozette potatoes. It has been truly gratifying to see the energy and support for our plant pathways and these evolving school garden programs. Special thanks go out to Bay Hay & Feed for their donation of hundreds of seed packets, which get distributed through our edible education programs with all our partner schools!